In news that’s almost unbelievable, 10 CDC researchers suggest that delaying breastfeeding in favor of making the rotavirus vaccine more efficient may be useful. What the frog! Or in other words, what we say around my house when we can’t cuss out loud. The study, publicized in the CDC’s 2010 spring newsletter, has remained fairly quiet until now but recently hit mainstream media. This worries me, because some parents may take the study at face value and delay or stop breastfeeding in order to pump up the effectiveness of the rotavirus vaccine. The U.S. has abysmally low rates of breastfeeding as it is, so the damage research like this could do is significant. As a parent, if you hear about this study, you should strongly consider how the benefits of breastfeeding outweigh any smaller inactivity of the rotavirus vaccine. Honestly, when it comes to who funded this study, my money is on the formula companies – although that’s just a guess. Official CDC vaccine documents (pdf) point out that rotavirus is a serious virus that causes diarrhea, abdominal cramps, fever and other nasty problems, most often in babies and young children. There’s plenty of research to back this up. Rotavirus can be very serious, especially when accompanied by vomiting and fever, leading to dehydration. 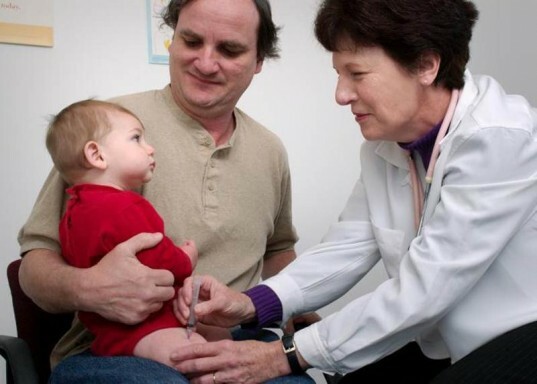 The CDC goes on to note that before the rotavirus vaccine was invented, this virus accounted for around 400,000 doctor visits, 200,000 emergency room visits, 55,000 to 70,000 hospitalizations and 20-60 deaths in the United States each year. Other research and the World Health Organization (WHO) agree, rotavirus is a problem, and it is the most common cause of severe diarrhea in infants and young children, not just in the U.S., but globally. The WHO estimates that rotaviruses are responsible for around 527,000 deaths each year, with most (85%) of the deaths occurring in low-income countries in Africa and Asia. Rotavirus is passed via touch, for example, when a young child touches a contaminated toy they may catch the virus. Normally in the U.S. this virus is a problem because kids and parents don’t wash their hands enough, which can also be an issue in other countries, along with a lack of clean water to wash up with. There’s much debate around what may prevent rotavirus. The American Academy of Pediatrics (AAP), along with the CDC and the WHO recommends a rotavirus vaccine to help prevent this virus. The Nemours Foundation also notes that frequent hand washing is an excellent tool to limit the spread of rotavirus infection. Some research also notes that breastfeeding may be even more effective than the rotavirus vaccine, when it comes to rotavirus protection. Although, research is mixed, with some studies showing little difference in rotavirus immunity between breastfed and formula fed babies. Some research even shows that zinc may help prevent rotavirus. What’s perfectly clear is that the jury is still out about the best way to prevent rotavirus and stopping breastfeeding barely makes the list. Overall, the benefits of breastfeeding, right now, far outweigh any increased vaccine efficiency you might gain from not breastfeeding. Breastfeeding is a cost efficient, perfect food that provides all of the nutrients and antibodies your baby needs when he needs them, and breast milk is easier to digest than formula. Breastfeeding can reduce the risk of SIDS, supports early bonding, reduces the risk of childhood obesity, reduces the risk of asthma and other respiratory infections plus results in kids who eat healthier. Don’t stop breastfeeding just because it may increase vaccine efficiency. There’s simply not enough research to support this action. This kind of irresponsible "reporting" makes me angry. I'm 110% supportive of breastfeeding anywhere, anytime, for as long as mother and child want/need/can, but this is the kind of article that turns me off to openly supporting breastfeeding. The CDC article does NOT suggest anything about stopping breastfeeding in any sort. The article simply states that based on the research they did, that breastmilk consumed by baby immediately after baby receives immunizations may inhibit the efficacy of said immunizations. The obvious conclusion is that mothers may want to postpone nursing immediately after baby receives immunizations. One would discover this information if one clicked on the links within your article, but how many people will click on those links - and how many people will muddle through the CDC article to the "interpretation" at the end, as the terminology in the article obviously indicates it is written for a technical/medical audience. Your article suggests the CDC is recommended stopping breastfeeding in order for parents to "fully" vaccinate their babies, which is NOT the case. Parents who take your article at face value may then choose not to vaccinate their children, which is a public health risk for MY children. This is irresponsible "journalism" at best and dangerous at worst, and makes me ashamed if I have ever recommended your misinformation to anyone. I agree with the previous commenter, and she said it so well I don't think I can add much to it. This is a very irresponsible post. The CDC researchers never suggest that mothers should stop breastfeeding. Obviously they wouldn't; breastfeeding is recommended by all governmental health organizations. Their study showed that breastfeeding may make vaccines less effective, and that may be true, but it doesn't mean we should stop breastfeeding. And they aren't telling us to do so! I don't know if you're just naive or actively trying to twist the story to fit an anti-vax worldview, and Naturalnews.com is doing. Calling an anti-vax website part of the "mainstream media" seems a stretch, I think. Be careful where you get your information--I know I'll be more careful where I get mine. In news that's almost unbelievable, 10 CDC researchers suggest that delaying breastfeeding in favor of making the rotavirus vaccine more efficient may be useful. What the frog! Or in other words, what we say around my house when we can't cuss out loud. The study, publicized in the CDC's 2010 spring newsletter, has remained fairly quiet until now but recently hit mainstream media. This worries me, because some parents may take the study at face value and delay or stop breastfeeding in order to pump up the effectiveness of the rotavirus vaccine. The U.S. has abysmally low rates of breastfeeding as it is, so the�damage�research like this could do is significant. As a parent, if you hear about this study, you should strongly consider how the benefits of breastfeeding outweigh any smaller inactivity of the�rotavirus vaccine. Honestly, when it comes to who funded this study, my money is on the formula companies - although that's just a guess.